Omg King Charles spaniels are the cutest ever. I love this picture. My Cavalier is a super little hound and this really depicts the breed superbly. The tri-colour's frown is pretty well perfect. Lovely! 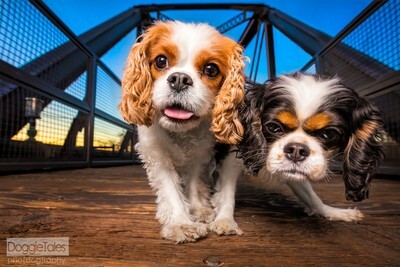 I'm the happy man servant to two black and tan Cavaliers and they are the joy of my life. I love this photo and the expression on the tricolor is timeless. This is one of my favorite dog shot's I've ever taken. When I came across this location I had a picture in my mind of the resulting photo I wanted to get but little Skylar's reaction to me taking too long to hand over her chicken snicky~snack totally MADE the image!